12-08 FLASH! Brilliance de Peru, son of ION, sold for over half a million dollars! Rainie, born near Mt. Rainier, was part of our starter herd package. 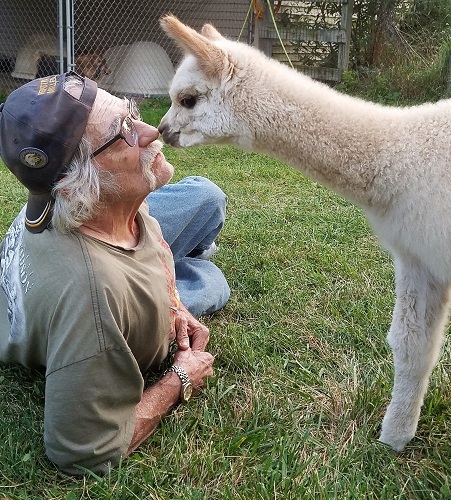 Her dam was a dark brown Peruvian import, but it was the 4 month old cria at her side that caught my eye in a pen full of dams and crias of all colors. This cria stood out, and for good reason. 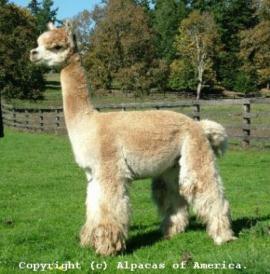 Her sire is Peruvian Ion, full Alianza heritage, who sold at auction for $80,000, the highest selling alpaca in the America's Choice 2005 auction. 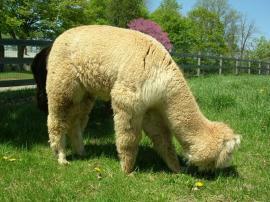 Full Alianza bloodlines are quite rare and prized by discriminating breeders. Ion's son, Brilliance De Peru sold in Dec. 2008 under private treaty for over 1/2 million! Two of Ion's daughters sold at auction for a combined total of over $75,000. Ion represented nationally known genetics, a history of show winning offspring, and commanded a $4,000 stud fee. 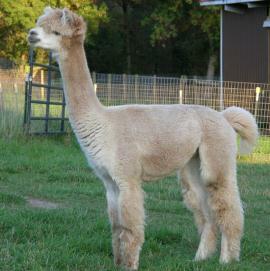 Here is your chance to own one of his adult daughters, proven in her ability to produce Champion award winning cria. Rainie is well built, both confident and easy to handle, with beautiful fiber. We didn't begin showing until 2007, so Rainie was never shown. 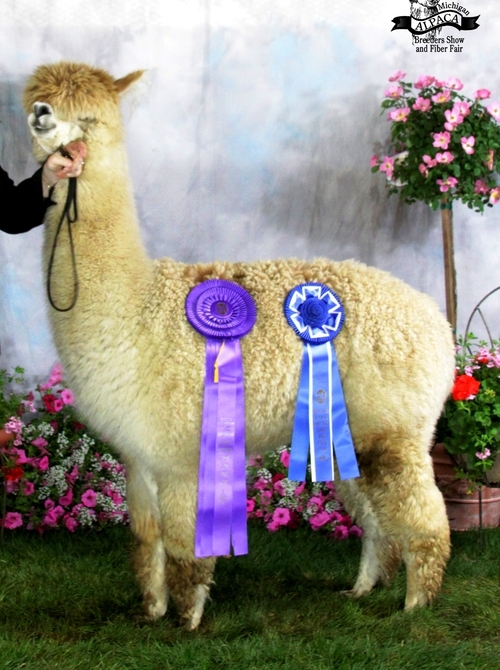 Her first cria born on July 4th, 2008, appropriately named Liberty Belle won fawn Color Champion her first show, and was first to make the cut from a class of eleven at the 2009 AOBA Nationals. She earned a 2nd place at the Nationals, and a LOT of compliments from those around the ring, as well as from the shearer at the Nationals. In 2010 Liberty went on to win a 2nd Color Champion. Rainie was bred to 5 X Color Champion, part Accoyo, MFI Peruvian Juxtaposition for a 2010 cria. Juxtaposition sold for $60,000 as a two year old at the 2007 Breeders Choice auction. 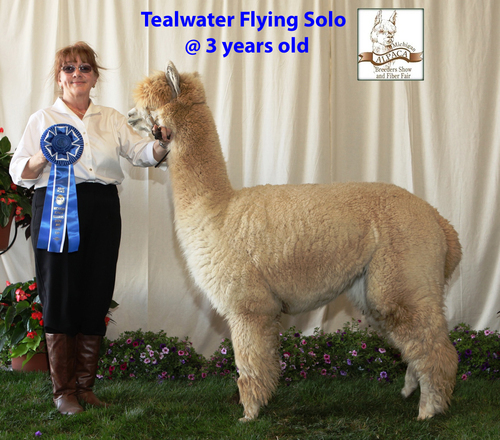 From that breeding Rainie again delivered to us a strong, light fawn female named Tealwater Flying Solo. In her first show Solo won Reserve Color Champion! 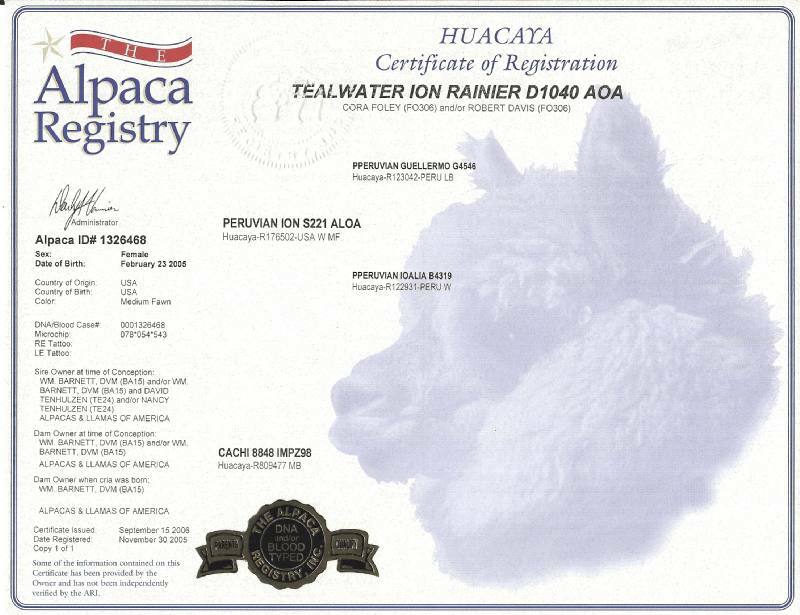 If you are looking for a high-quality fawn capable of producing Champions, then look no further. She possesses lingering fineness high-end genetics; her offspring will provide excellent value in your breeding program! We have so many young females to breed but limited capacity, so Rainie is available for lease! 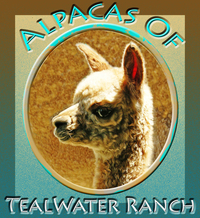 Lease Tealwater Ion Ranier for $2,500 for the sole purpose of producing a cria that will be yours once weaned. You choose the service sire, pay the stud fee and any transportation or boarding costs necessary for breeding. Given Rainie's genetics and potential, we reserve approval rights of proposed studs. We will arrange the breeding, and keep Rainie in our pregnant females group to ensure she receives the optimum care and nutrition with the least stress on her pregnancy. You will have the benefit of a cria from a foundation female, high quality proven champion producer with none of the work!